Posted on June 7, 2013 Posted in Elementary, High School, Middle School, My Products, Teachers Pay Teachers	. 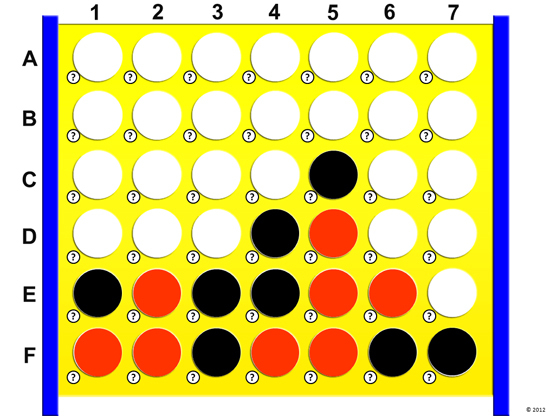 This Connect Four PowerPoint template can be used to review with your class as an alternative to the classic, Jeopardy! It’s my students’ favorite game! I like to split my class into two teams and see who can get three sets of four in a row first. There’s more strategy involved in winning than your typical review game, so, the kids really love it! I’ve included the instructions directly from the PowerPoint file below so that you can get an idea of how it works. Click here to check out this game template on Teachers Pay Teachers. 44 slides, includes basic animation and sound. 1. Come up with 42 review questions and answers. 2. Enter the 42 questions into slides 3 through 44 (one question per slide). Note: Keep a list of the questions and answers with you, just in case you get caught off-guard! 1. Divide your class into two even teams. It’s fun to do boys vs. girls if the numbers are roughly equal! 2. Have them sit in a groups (with their teams) and have each team select a captain. The captain is the only person who can pick spots and provide answers. It gets too confusing, otherwise. One team will be the black team (and control the black “checkers”) and the other team will be the red team (and control the red “checkers”). 3. Choose which team will go first. I like to flip a coin. 4. The first team to answer will choose one of the spaces. They have to choose spaces from the bottom of the board first, then they can progress up toward the top as they “stack” pieces. Think about gravity and how the normal Connect Four game plays! 5. When the team chooses a space (for example, F4), click the small question mark that is next to that space (toward the bottom left). This will take you to the question slide for this space. 6. Read the question to the team and give them one minute to discuss and answer the question. If they get the question right, return to the main game board by clicking the icon toward the bottom-right of the question screen. Then, click the spot where they wanted to place their “checker”. If you click once, the spot will be filled with a black checker. Click again to change it to a red checker. This way, it’s easy to switch between red and black if you make a mistake. 7. If the team got the question wrong, click the icon toward the bottom-right of the question screen to return to the game board. The team’s turn is now over. 8. The first team to get three groups of four “checkers” in a row wins! Teams can score horizontally, diagonally, and/or vertically. 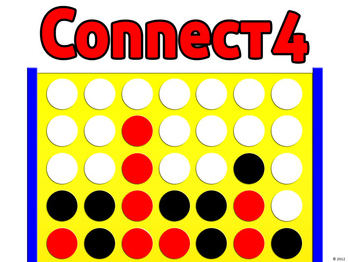 If you’re ready to play this game in your class, get it here!